Shocking conditions or winding roads? When asphalt becomes boring and gravel, dirt and dust are too tempting, HEAVY TRACK® 4 x 4 shock absorbers by KONl is the ideal all-terrain option. 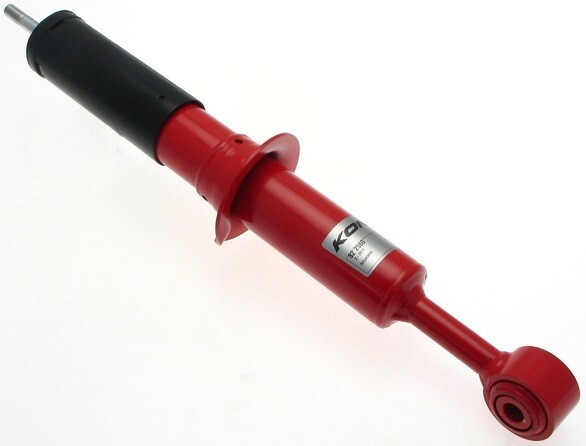 This shock absorber will deliver optimum road holding and comfort both on and offroad. Our 4 x 4 shock absorbers have been specially developed by KONI for 4WD's and Sports Utility Vehicles (SUV's). Tested under extreme conditions, these dampers satisfiy the highest offroad demands regarding safety, stability and grip. These shocks ensure greater stamina for both drivers and vehicles. Also on the road, you can count on greater comfort and a higher level of safety, more stability and better roadholding. In short, HEAVY TRACK® shock absorbers from KONI are perfect 'all road' shocks absorbers. Irrespective of the driving conditions. KONI HEAVY TRACK® shock absorbers are simply and completely adjustable. This means that the damping characteristic can be completely adapted to the circumstances. Furthermore, HEAVY TRACK® shock absorbers have large reserves of damping power available. And that's not all. KONI shocks are of superior quality. This is not only evident from the robust construction but also from the materials used such as the seals which are resistant to high temperatures.